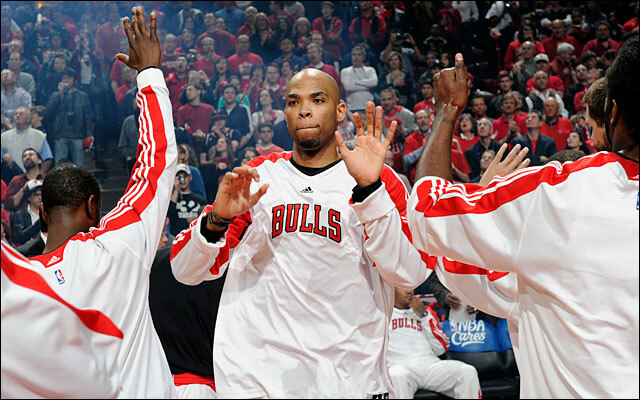 Could Taj Gibson Be The Next To Go? You like Taj Gibson, and apparently other NBA teams do as well. The NBA trade deadline is Feb. 20, and while most trade rumors surrounding the Bulls are about Kirk Hinrich and Mike Dunleavy, there’s reportedly at least three teams that have already asked the Bulls about Taj Gibson. And while Hinrich and Mike Dunleavy have been churning in the trade rumor mill for more than a month, Taj Gibson’s name is the one that is picking up, and could determine how serious the Bulls are in clearing space for a max contract to land the likes of a Carmelo Anthony or LeBron James. According to a source, the Lakers, Wizards and Bobcats have each inquired about Gibson, but they were preliminary talks in which the Bulls did not like the return. I really don’t like the idea of trading Taj, though that may be due more to my love for him as a player than actual basketball sense. Whatever the case is, I’ve really been looking forward to seeing what Taj Gibson could do when he’s a starter after the Bulls amnesty Carlos Boozer. However, I also know that, as Cowley mentions, if the Bulls are serious about signing a Carmelo Anthony or LeBron James (LOL), Gibson will have to go. If the Bulls were to amnesty Boozer and move Gibson that’s $24.8 million off the books next season right there. Of course, given the way NBA trades work, that means if the Bulls do move Gibson this year, it’ll have to be for expiring contracts and maybe a draft pick or two. If they take on any players with multiple years left on their deals, they might find themselves in a position where they still don’t have enough room for Melo or LeBron (LOL). Which is why I think that, if the Bulls are going to trade Gibson at some point, it won’t be during the season but rather in a sign-and-trade this summer. Moving Gibson now, without a guarantee of landing either James (LOL) or Anthony, could put the Bulls in the same position they were in a few years ago when they ended up signing Carlos Boozer. And nobody wants to go through that again. This entry was posted in Chicago Bulls and tagged Carlos Boozer, Kirk Hinrich, LeBron James, Mike Dunleavy, Taj Gibson, Trade Rumors by Tom Fornelli. Bookmark the permalink. I don’t see the bulls signing either Lebron or Carmelo. I don’t see why either would want to come here. I’ve learned my lesson after the last big free agency period where the bulls had money to spend and we ended up with Boozer. I agree. I think the Bulls will be nothing more than leverage for them.